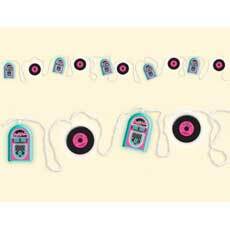 50's party decorations and party supplies. 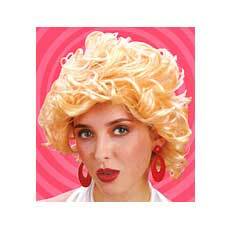 Let the Party Girl help you find hundreds of unique 50's party decorations. Rock the night away! Add some salsa and your favorite tortilla chips to our plastic Chili Pepper Chip n' Dip Tray for fun feasting at your next fiesta. This great looking 10 1/2" Chili Pepper Chip n' Dip Tray is perfect for spicing up your fiestas, western theme parties or adding a great looking accent to your Cinco De Mayo celebration tableware. Please order in increments of one tray. 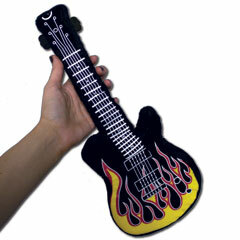 Rock stars will delight with our flame pattern 15" plush guitar. 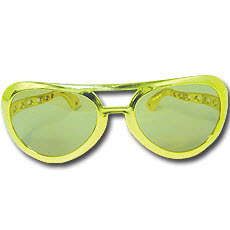 Use as a pillow, as a part of your rock star decorations or to be part of the pretend band for a karaoke sing a long.. 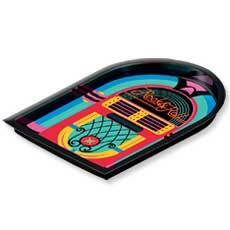 Perfect for prizes, gifts or favors and a child favorite. 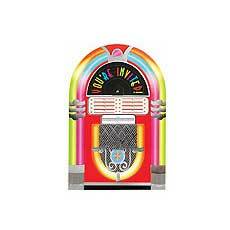 Our 15" colorful flame plush guitar is sold by the piece. Please order in increments of 1 piece. Flashing Guitar, Five extra bright L.E.D. 's (2 Red, 2 Yellow and 1 Blue). 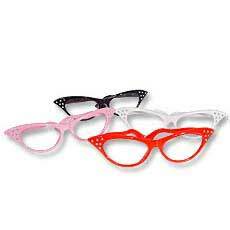 Individually packed in a clam shell with a hang tag for easy display. Batteries are included and installed. Price shown is for 1 dozen (12) pieces. 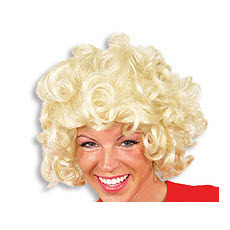 Please order in increments of 1 dozen pieces per style. Please Note: We are moving away from Magnetic connectors to either Clip-On or Butterfly connectors. This product has a Butterfly connector. A Butterfly connector may create a small hole in the garment you attach it to. To see a demo of this connector, please click the link below.. Replacement batteries for this item: 2 pcs, type CR927. 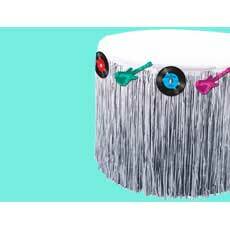 Our colorful I Love Rock & Roll paper goods pattern is the perfect way to decorate your table for your decade theme events. 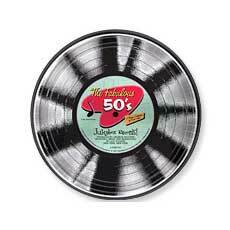 Remember the music of the 50's, remember Rock & Roll? Decade themes are a terrific way to celebrate milestone events. 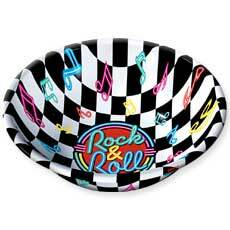 Rock & Roll beverage napkins are 16 per pack. Please order in increments of 1 pack. 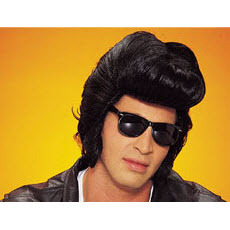 Rock and roll is here to stay and the 50's decade is a great theme to celebrate milestone birthdays, anniversaries and the music of the generation. 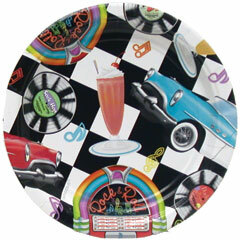 Our colorful Sock Hop 7" plates are 8 to a pack. Please order in increments of 1 pack. 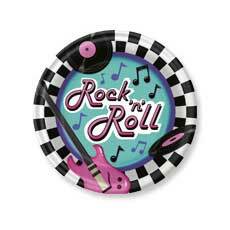 Rock and roll is here to stay and the perfect way to celebrate milestone birthdays, anniversaries and the music of the 50's. 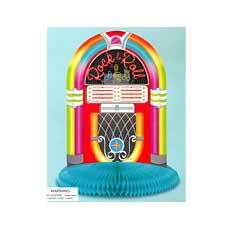 Our Sock Hop paper tablecover is 54" wide by 102" long and sold by the piece. Please order in increments of 1 piece.